Home » Be Part of the Solution! 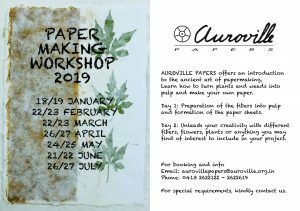 Some of you may have attended the Auroville Trashion Show back in early February or seen photos or videos on social media. It was a great event that we at Eco Femme were delighted to participate in for the first time. 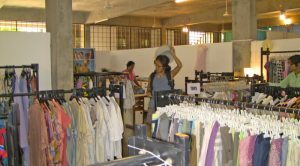 Founded in 2010, the Auroville Trashion Show aims to raise awareness of the importance of waste reduction and especially non recyclable waste. 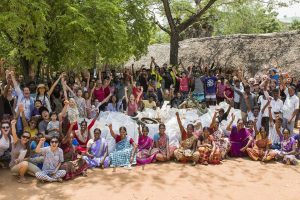 This year before the show, a thirty minute presentation introduced the organisations currently working in Auroville to reduce waste, raise awareness and ‘be part of the solution‘. We wanted to share details of these organisations on our blog as we’re proud of the work our little community puts into this topic. Read on to learn more and to get inspired – you can also watch the full show HERE! Auromira Developers, a construction company in Auroville, takes non-recyclable, non-biodegradable waste styrofoam from the Eco-Service and villages around Auroville and mixes it with cement, up-cycling it to create light, strong, insulating bricks that can be used for building houses and other structures, whilst at the same time keeping harmful styrofoam out of landfill. 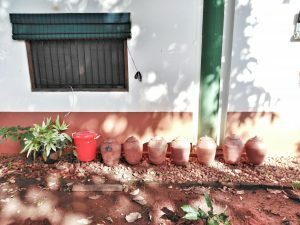 Way back in 1998, a group of young residents decided to take matters into their own hands and began collecting rubbish along the side of the roads around Auroville and in neighbouring villages. 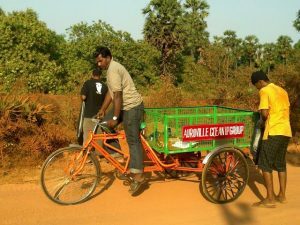 Still going strong today, the Auroville Clean-Up Group is the community’s longest running clean-up initiatives. Over the years they estimate that they’ve collected tons of waste from our roadsides. Not only do they clear the landscape of trash, they also encourage tree and shrub-planting programs and work to get communities involved in keeping the environment clean, beautiful and healthy for us all. 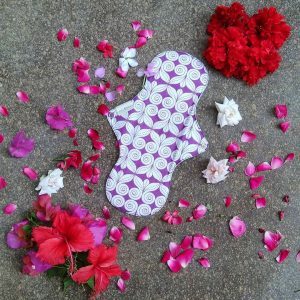 Eco Femme makes reusable, environmentally friendly organic cloth washable pads as well as providing menstrual health education sessions to women and girls within India. One cloth pad is the equivalent of 75 disposable pads. In 2017-18 alone, we saved almost 10 million disposable pads from landfill! 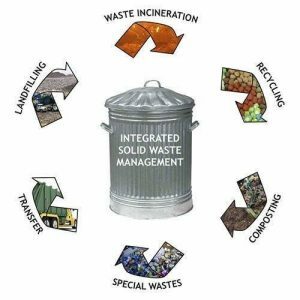 The Eco Service is the backbone of the community’s waste management system. The Eco Service collects waste from households, communities, guest houses, restaurants and units, and processes it at a sorting shed in Kottakarai. 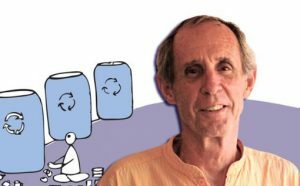 Waste is then either sold to recycling dealers, or landfilled at the Auroville landfill. 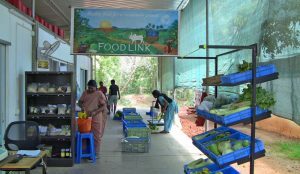 Acting as a link between Auroville farms and dairies and the rest of the community, FoodLink receives Auroville produce in bulk and distributes it to our food co-operative, Pour Tous Distribution (PTDC), other Auroville food outlets and also directly to individuals. Like PTDC, they also supply milk, yoghurt, jam and other goodies in reusable glass jars and bottles. And it’s working. For example last year 71% of the milk and 85% of the grains they sold were free from plastic packaging. Hooray! Since as long as most us can remember, there’s always been the Free Store in Auroville. Their philosophy is simple: everything is free for Aurovillian and Newcomer residents. In this age of fast fashion-driven waste, the Free Store is a refreshing breath of fashion longevity. On top of that they also upcycle waste clothes that’d otherwise go straight to landfill, into cute tailored bags that they also give away for free! So if you’ve got some sad and neglected garments, take em to the the Free Store today, where they’re sure to be loved again! 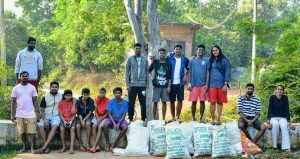 Following in the footsteps of groups like AV Cleanup, Let’s Talk Trash is another group of young people who meet twice a month on Sunday mornings to pick up trash from areas in and around Auroville. In 2017 alone, they estimate they collected over 800 kilos of landfill waste and more than 500 kilos of glass bottles in the area. They’re also working towards creating a litter map for Auroville, to visually emphasize the issue of litter in the city. They’re always looking for more enthusiatic participants to help them keep out community clean. Since 2002, Maha Saraswati Freestore, next to Kuilapalayam post office has been accepting and repairing fridges, televisions and general home appliances for reuse and spare parts. The service aims to help by breathing new life into old electronics, and at same help the environment by reducing e-waste. By repairing, reusing and extending the life of things, rather than throwing them away and buying new ones, you’re taking meaningful steps towards being part of the solution. MG Eco Duties makes all-natural 100% environmentally-friendly, GM-free, biodegradable, non-toxic, pro-biotic, affordable, body and home cleaning products with zero to minimal packaging. 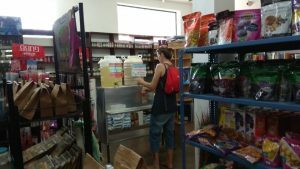 They have installed refill stations in a number of Auroville stores for their liquid products which further encourages eco friendly practices. They even made us a soap especially for washing cloth pads! NALAN is an environmental research and service organisation. NALAN, innovate products and promote technologies to provide effective and sustainable solution to the problems in the different fields of environment. 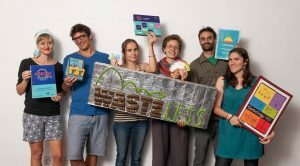 They have created a household organic waste composting system, that raise awareness of the importance of separating organic waste from inorganic waste, whilst at the same time creating valuable compost. 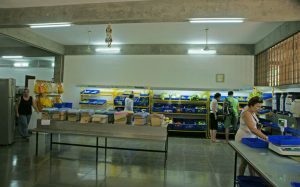 In Auroville, the Pour Tous Distribution Centre or PTDC, offers participants an opportunity to reduce the amount of packaging they consume. 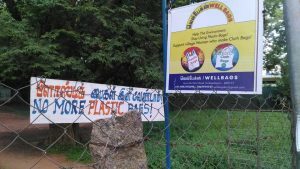 For example, last year, in the dairy section alone, PTDC helped the community reduce waste by 10,000 plastic yoghurt and milk containers, by supplying Auroville dairy products in re-usable bottles and jars. In the biscuit department, PTDC participants saved 33,000 multi-layer packets by buying loose biscuits and snacks instead of pre-packaged commercial brands, and they got much better biscuits at the same time. Overall, PTDC’s efforts through bulk sales and reusable containers represent a huge step in the right direction, and offers us all an opportunity to be part of the solution. 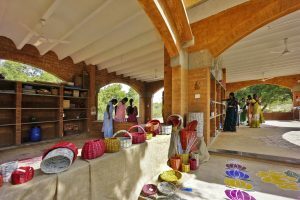 The Smallsteps project was launched by Upasana Design studio in Auroville on Earth Day 2007. 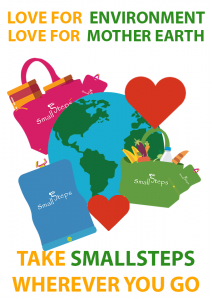 The goal of Smallsteps is not only about selling cloth bags, but also to make people aware of the harmful impact of plastic bags on the environment. The internationally-renowned Upcycling Studio’s philosophy of only designing and creating with waste has seen it demonstrate Auroville’s amazing creativity at numerous exhibitions and recently it partnered with a global upcycling youth education project, supported by the European Commission and other international partners around the world, to seek to develop new and creative ways to upcycle waste into value. 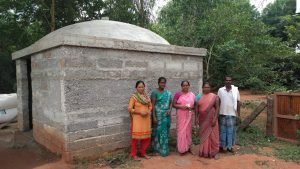 Waste Without Borders or WWB aims to create a Solid Waste Management System for the bio-region around Auroville. 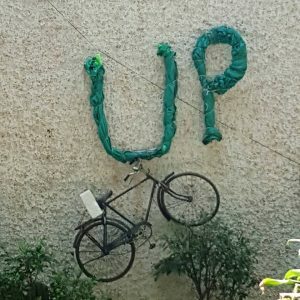 It wants to help local village Panchayats set up and manage door to door collection and implement a waste segregation system and run awareness campaigns in local schools. On the occasion of World Clean Up Day – 15th Sept 2018, they organized a Koot Road clean up action. Inspired by this, shopkeepers of Koot Road approached WWB to set up a Waste Management System for the area. This project will act as a test case for future similar initiatives. 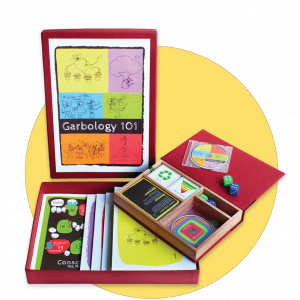 Garbology, a set of educational activities about trash. kNOw PLASTICS, a comprehensive 8-lesson program for students aged 6 – 15, that teaches them about the dangers of plastics and how to reduce once-time use plastics. Pick It Up, a card game aiming to educate how to separate and recycle your waste through the informal sector, while highlighting common waste items which have high monetary value. Inspired and guided by Auroville children and teachers, the team’s research has now become part of the Tamil Nadu school curriculum and reaches over 3 million students every year! Similarly, Wellbags, a project of the Kuilai Creative Centre makes a range of cloth bags. It aims to offer a livelihood for village women, whilst at the same time working towards a plastic-bag free future. If we assume that single cloth bag could replace 6 one-time use plastic bags a week, that would come out to 24 bags a month, 288 bags a year, 22,186 bags in an average life time! The primary goal of Wellpaper is to empower local village women with skills to build, manage and develop a livelihood. All Wellpaper products are hand-made and eco-friendly, transforming newspaper into art and accessories. The world-famous B and his Trash Mahal team are forever seeking ways to build, create a zero-waste world. 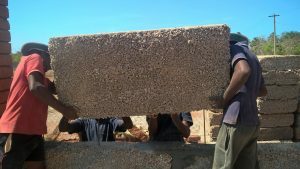 This objective sees them explore new and creative methods to use things normally thrown away such as tetrapaks for roof tiles, building material and other fabulous applications. Stop using one-time use plastics – no more plastic bottles, no more plastic bags, no more drinking straws, no more plastic cutlery and so on. If you absolutely have to buy a one-time use product, keep it, wash it, re-use it, recycle it, repair it, upcycle it, but most of all, don’t throw it away. Spread the message, tell your friends, your family, the people you work with; your neighbours, explain to kids the importance of putting rubbish in the bin. We hope this article inspires you to infuse consciousness into your trash. To stop, think and act. Be part of this movement. Humanity can rise up and solve this problem. We can become part of the solution.